When Jay Jay Johnson toured Sweden in the summer of 1957, his pianist, Tommy Flanagan, drew accolades. Flanagan’s playing on Miles Davis’ tunes such as "Vierd Blues," and "In Your Own Sweet Way" had made hipper Swedes already aware of his abilities. Among these were executives for Metronome Records, and the result was Flanagan’s first recording date under his own name, in Stockholm on Aug. 15, 1957. Flanagan later in his career became known as the "Jazz Poet," an artist whose consummate lyricism and remarkably smooth swing feel have long captivated listeners. Happily, the complex, pliant lines, the rhythmic snap, and that great taste in tunes were already in place when the Detroit-born, Bud Powell-influenced Flanagan arrived in New York in the late 1950s. No wonder he soon played and/or recorded with Miles Davis, Sonny Rollins, J.J. Johnson, and others. 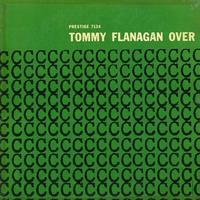 This choice album — Flanagan’s first — was made in Sweden while the pianist was touring with Johnson’s quintet, which included bassist Wilbur Little and drummer Elvin Jones. The appealing program boasts Billy Strayhorn’s lulling "Chelsea Bridge," Charlie Parker’s lively "Relaxin’ at Camarillo," the crafty original "Eclypso" — part calypso, part swing — a blues, and two numbers dedicated to Swedish climes. Worth the Wait! Worth Every Penny! What caught my attention about this AP release was the rate at which it was flying off the shelf at all the major online retailers. When I decided to get one I was shocked to learn it was out of stock everywhere I looked, including Acoustic Sounds. Finally, early this Week I saw that it was back in stock on Acoustic Sounds website so I ordered it on the spot. When I finally listened to the record a while ago it did not disappoint. Trio music consisting of Piano, Drums and Bass. The music is relaxed and unobtrusive, but still enjoyable. Spectacular is how I would described the sonics on this record, spacious, natural and transparent. It's like hearing a tape. Once I heard it, I immediately realized why this record was fast selling out; this release renders this recording in breathtaking realism--that explained why people were snatching this records up like hot cakes. This might be your last chance to get a copy so don't wait . Tommy Flanagan is great, of course, but Elvin Jones sounds absolutely superb on this Swedish recording with a dynamite drum sound. Fine surfaces.